Iraqi Kurds voted in an independence referendum Monday, defying warnings from Baghdad and their neighbours in a historic step towards a national dream. 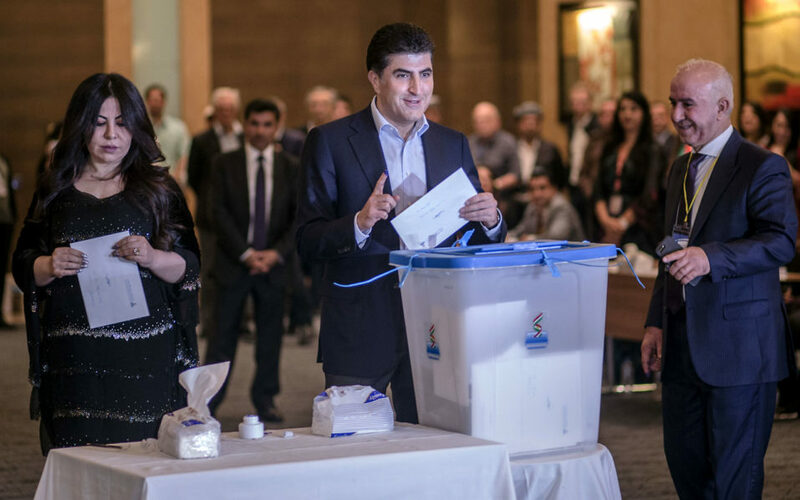 The non-binding vote, initiated by veteran leader Massud Barzani, has angered not only Iraq’s federal government but also neighbouring Turkey and Iran, who are concerned it could stoke separatist aspirations among their own sizeable Kurdish minorities. Turkey on Monday warned the Iraqi Kurds would face sanctions over the vote, while Iran closed its border with the autonomous region. The United States and other Western nations have also raised concerns, saying the vote could hamper the fight against the Islamic State jihadist group in which cooperation between Baghdad and the Kurds has been key. Kurdish flags were festooned in all the streets, on cars and outside homes across Iraqi Kurdistan. Voters headed to the polls early Monday, many men dressed in traditional Kurdish dress of brown shirt and billowing trousers for the occasion. Young girls wore caps emblazoned with the Kurdish colours of red, white, green and yellow, and regional flags around their necks and shoulders. “I came very early to be the first to vote for a Kurdish state,” Diyar Abubakr, 33, said outside a polling station in regional capital Arbil. “It’s a day of celebration today. That’s why I’ve put on our traditional outfit, which I bought for the occasion,” he said. “I brought this cow as today the state is born and it’s tradition to slaughter a cow for a birth,” Dalgash Abdallah, 27, said. Initial results are expected to be announced 24 hours after polls close. An overwhelming “Yes” outcome is expected, but Kurdish officials have said there are no plans for an immediate declaration of independence. Barzani, smiling and wearing a traditional outfit, cast his vote early in the morning. Polling stations are scattered across the three northern provinces of autonomous Iraqi Kurdistan — Arbil, Sulaimaniyah and Dohuk — as well as in disputed bordering zones such as the oil-rich province of Kirkuk. In Sulaimaniyah, second city of the autonomous region, 40-year-old Diyar Omar came to cast his vote also wearing traditional clothes. “I’m so happy I could take part in this independence vote during my lifetime,” he added. In disputed Kirkuk, mosque loudspeakers blared a prayer normally reserved for religious celebrations, but participation in the voted was limited. Those who did take part showed off their ink-stained fingers after casting their vote. “If I had 20 fingers, I would have voted 20 times for my state,” Ibtissam Mohammed, 45, said. Kirkuk governor Najm Eddine Karim, who was fired by Baghdad after his provincial council decided to take part in the vote, also voted. But in Khanaqeen, another disputed territory in Diyala province, Um Ali, 30, said she feared the outcome of the vote and its consequences for her and her children. “I don’t want separation from Iraq, violence or war,” she said. Iraqi Prime Minister Haider al-Abadi on Sunday pledged to take all the “necessary measures” to protect the country’s unity as his government urged all countries to deal only with it on oil transactions. Abadi said the Kurds’ unilateral decision to stage a referendum affected both Iraqi and regional security, and was “unconstitutional and against civil peace”. Hours later, the Iraqi government called on all countries “to deal only with it on matters of oil and borders”. The Iraqi Kurds export an average 600,000 barrels per day (bpd) through a pipeline running through Turkey to Ceyhan on the Mediterranean. Turkey’s Prime Minister Binali Yildirim said Ankara was working on the details of sanctions against the Iraqi Kurds. “We will take those steps with regard to air space, and how the border gates will be governed,” he said. Tehran closed its border with Iraqi Kurdistan after saying on Sunday it had blocked all flights to and from the region at Baghdad’s request. Iranian news agency IRNA said Iran’s President Hassan Rouhani had called Abadi late Sunday to reiterate his support. But Barzani said the Kurds’ “partnership with Baghdad” since the ouster of dictator Saddam Hussein in a 2003 US-led invasion had failed. He however said the vote was “not for defining borders or imposing a fait accompli”. “We want a dialogue with Baghdad to resolve the problems, and the dialogue can last one or two years,” Barzani said of zones such as Kirkuk.